Fabio Vettorel (18) was released yesterday after he had been jailed for 4 months in the Billwerder prison in Hamburg, Germany. He was the last Italian in jail after the NoG20 protests in July. 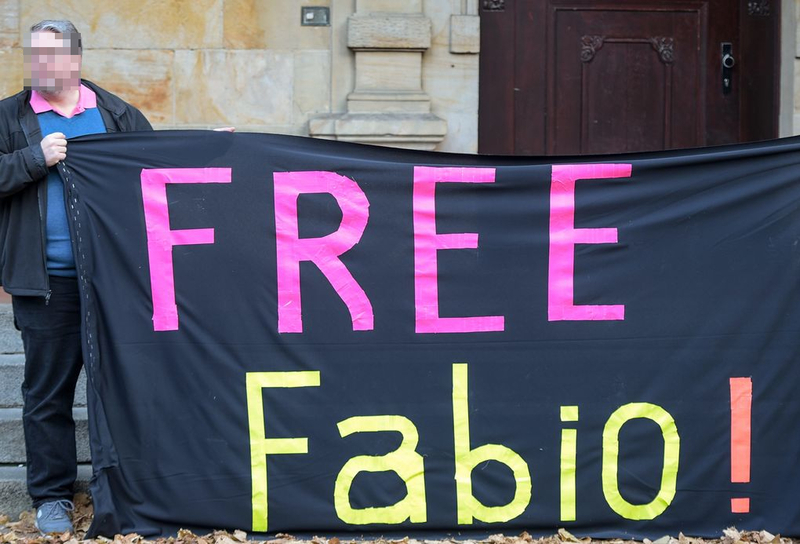 The young man from Feltre was arrested in the aftermath of the mobilizations and accused of “creating public nuisance”, the “attempt to inflict damage by dangerous means” and “resistance against a public officer.” Although he has been released the trial against Fabio is still ongoing, until now the state prosecution wasn’t able to proof any of their accusations, except that Fabio was seen on a protest. The statement was originally published and translated by Infonaut. Today you are called upon to judge a man. You called him an “aggressive criminal” and “disrespectful of human dignity”. Personally, I don’t care about the monikers you ascribe to me. I am just a good-willed boy. First of all, I would like to say that probably petty politicians, police commissioners, magistrates think that by jailing and arresting some brat dissent in the streets could be stopped. Probably their highnesses think jails are enough, in order to quash rebel voices raising everywhere. Probably their highnesses think that repression will stop our thirst for freedom. Our will to build a better world. Well, they delude themselves. And it is history to prove them wrong. Because countless boys and girls like me went through a court like this one. Actually, today it is Hamburg, yesterday was Genoa, and earlier again was Seattle. You try to fend off the voices of revolt rising everywhere by any “legal” means, by any “procedural” means. Anyway, whatever the ruling of this court will be, it will not affect our protest. Once again many boys and many girls, driven by the same ideals, will take it to the streets of Europe. In spite of the prisons that you strive to fill with political prisoners with such trouble. But let’s get to the point, madam (judge), gentlemen (jury), madam (public prosecutor), gentleman (assistant of the juvenile court). As you can figure out, today I want to exercise my right to not declare anything regarding the specific event I am convicted for. Yet, I would like to emphasize the reasons that drove a young worker hailing from a remote town in the eastern Prealps to come to Hamburg. In order to protest the G-20 summit. G-20. Just the name has something wicked in itself. Twenty amongst men and women, representatives of the twenty richest and most industrialized countries in the world take a seat around a table. They take a seat all together, in order to decide our future. Yes, I meant it: our one. Mine, as the one of all the people sitting in this room today, as the one of other 7 billion people dwelling in this nice Earth. Twenty men decide about our life and our death. Of course, the populace is not invited to this fancy banquet. We are just the stupid herd of the powerful of the Earth. Powerless spectators of this charade where a handful of men keep an entire humanity on the palm of their hand. I, madam (judge), thought thoroughly before coming to Hamburg. I thought about mr.Trump and his United States of America that under the flag of democracy and freedom style themselves as the world’s policemen. I thought about the many conflicts triggered by the American giant in every corner of the world. From Middle East to Africa. All of them in order to hoard this or that energy resource. It matters little that are the same people – civilians, women and children – to die over and over. I also thought about mr. Putin. Russia’s new czar. That systematically violates human rights in his country and mocks any opposition. I thought about the Saudis and their regimes based on terror, with which us Westerners make good business. I thought about Erdogan who tortures, kills and imprisons his opponents. I also thought about my country, where every government relentlessly cancels with a barrage of legislative decrees students’ and workers’ rights. In the end, here we go with the protagonists of the lavish banquet held in Hamburg last July. The greatest warmongers and assassins known by the contemporary world. Before coming to Hamburg I also thought about the injustice scourging the world today. It seems to me to be almost taken for granted to state again that the 1 % of the world’s richest population holds the same wealth as the poorer 99%. It seems to me to be almost taken for granted to state again that the world’s 85 richest men hold the same wealth as the 50% of the world’s poorer population. 85 men against 3 billions and half. These few data are enough to figure it out. And then madam (judge), gentlemen (jury), madam (public prosecutor), gentleman (assistant of the juvenile court), before coming to Hamburg I thought about my land: Feltre. The place where I was born, where I grew up and where I want to live. The medieval citadel is nestled like a gem in the eastern Prealps. I thought about the pink-dyed mountains in the sunset. About the astounding landscapes I’m so lucky to watch from my house’s window. About the beauty that sweeps that place. Then I thought about the rivers of my beautiful valley, defiled by the many businessmen that covet the concessions in order to build hydroelectric plants. Not caring about the damages to the populace and to the ecosystem. I thought about the mountains being hit by mass tourism or that became place of gloomy military drills. I thought about the most beautiful place where I live, that it is being sold off to speculators without qualms. Exactly like many other valleys at every corner of the world. Where beauty is destroyed for development’s sake. Then, in the wake of all these thoughts, I decided to come to Hamburg in order to demonstrate. For me, to come here was more a duty than a right. I deemed it right to stand against these heinous politics driving the world towards an abyss. I deemed it right to fight in order to make something slightly more human, dignified, fair. I deemed it right to take it to the streets to reaffirm that the populace is not a herd, and has the right to be consulted at the time of choices. The choice of coming to Hamburg was a partisan one. The choice of being on the side of who demands rights, and against those who want to take them away. The choice of being on the side of all the oppressed of the world and against the oppressors. The choice of fighting the big and small powerful ones that use the world as their plaything. Not caring about the populace always paying for it. I made my choice and I am not afraid if there will be, unjustly, a price to pay. However, there is another thing I want to tell you, believe me or not: I do not like violence. But I have ideals, and I chose to fight because of them. I am not done. In an age where everywhere in the world new borders rise, new barbed wire is laid, new walls rise from Alps to the Mediterranean, I find it wonderful that thousands of youths from every part of Europe are willing to take it to the streets of a single city together, for their future. Against any border. With the only common goal to make the world a better place than how we did find it. Because madam (judge), gentlemen(jury), madam (public prosecutor), gentleman (assistant of the juvenile court), because we are not the herd of twenty landlords. We are women and men that want to have the right of deciding about their lives. Fabio Vettorel, November 7, Courthouse Altona in Hamburg, Germany. Next post: #Montreal #Antifa: Maxime Fiset and His Centre Do Not Speak for Us! #NoG20: Cops Raided More Than 20 Buildings Across #Germany Today | Enough is Enough! Confronting Escalating Repression in Germany: In the Aftermath of the G20, a Call for Resistance from the Rigaer 94 | CrimethInc.